Kapil starts the show and still it is set in London and feels cold. He starts to speak on the differences in people in London and India. First instance is of the kiss and then marriage in London but in India it is the opposite. Next, about guests in Indian marriages who wait anxiously for the food but in foreign places champagne is opened first. In India, people open-up more after getting drunk and even sings in drunken mode. Kapil’s Nani (from London) comes on stage and Bittu asks where she have been before ? She makes taunt at Bittu’s family and speaks of going to a fast friend’s place to freshen up by carrying water in a tiffin box. She comes with her assistant played by actor/comedian Rajiv Thakur. The assistant informs Bittu that Nani was forced to freshen up in the garden on the way. Nani then sings Dil Garden Garden Ho gaya to show her excitement and feeling relieved. Bittu asks what about the garden ? The assistant makes taunt at her and tells that garden was destroyed with Nani’s actions there. Archana pulls the leg of Nani’s assistant – Rajiv by giving him 6 pts though he thought on getting 9 pts. She also reminds Kapil of giving him 8 pts when he was working for Comedy Circus. Kapil replies that for that reason he has started his own show on a lighter note. Nani asks Bittu when his family is going back and he replies of not knowing and even his wife Manju’s aunty is coming soon. Archana Puran Singh comes on stage and introduces herself as Mrs. Chaddha and Bittu thinks her as Manju’s Aunt but is mistaken. She makes taunt at Manju though speaks of not knowing her. She also came with actor Varun Sharma who portrays Manjot in the Dolly Ki Doli movie. Manjot is getting married and his family prepares to find and bring his Dolly. Manjot is excited and Bittu speaks that his Daadi’s name is Dolly and why are they taking her for Manjot. Archana as Mrs. Chaddha informs Bittu that they are going to bring a younger Dolly and not his grandmom. She actually came to interview young Dolly there. Later, Bua comes with a Doli (palanquin) and Bittu makes a taunt at her asking how come she is there with some other person’s Doli and reminds her that she is still unmarried. Arbaaz Khan comes out from it. and Bua starts to flirt with him and informs on how boys of her locality call her as Poonam Dhillon and she is happy. Bittu makes a taunt at Bua by suggesting that the boys who call her Dhillon were already not showing interest in girls since 30 years invoking laughter. Even some of those boys don’t have teeth and even doesn’t know what are they speaking. Bua becomes angry with Bittu and blames him for her marriage not taking place. Bittu also makes taunt at her that there are even no foreign boys are interested in her and she finds rejection from all places. Kapil welcomes Malaika Arora Khan and Bittu informs Bua about Malaika being the wife of Arbaaz. Kapil asks Arbaaz that whether he is scared to ask Mallaika for dance in his home thus he wants to see her dance in films. Arbaaz replies that he doesn’t wish to see some dance at home and thinks no one will ask his wife to do the same. 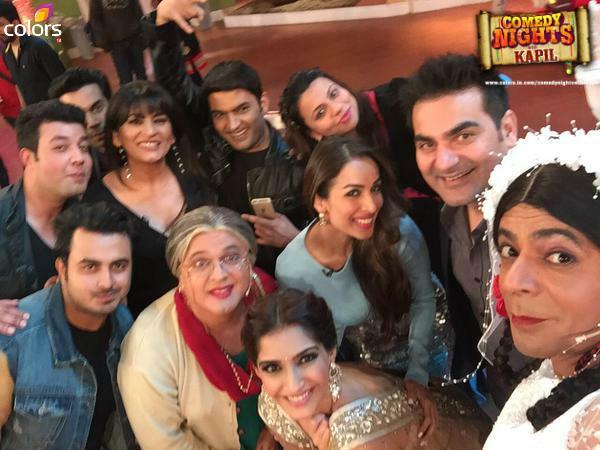 Kapil welcomes Sonam Kapoor and Raj Kumar Rao by complimenting their talent and greets them. Bittu asks Sonam how is his younger dad Anil Kapoor ? Sonam replies that his dad gets energized after spending time with Kapil. Kapil replies of getting inspired from Anil and even gets energy. He speaks on how Anil reacts and gets puzzled after knowing what his daughter has said at a press conference. Sonam gets a laugh on that note since she knows it is true. Kapil oipens the floor to the guests and an audience member Varun comes to dance with Malaika on the Munni Badnaam dance song. Sonam also joins them and all groove well. Gutthi comes on the stage by dressing as a Doli in bride costume – white gown and dances with Sonam, Raj Kumar, Kapil and others on the Fashion Khatam Mujhpe song. Kapil signs off by asking people to keep smiling and watching his show. Comedy Nights turned weekly and telecasts every Sunday @ 10 PM. * Dolly Ki Doli is a romantic comedy movie. The story of a con woman portrayed by Sonam Kapoor who robs men by faking her marriage. She follows clandestine and hidden approach to trap young men on the pretext of marriage and then runs away with money and jewelery. There is a cap who begins to find out Dolly and her activities. Actors Raj Kumar Rao and Varun Sharma portrays the role of young bridegrooms who are duped by Dolly. – It is scheduled to release on 23rd January 2015.